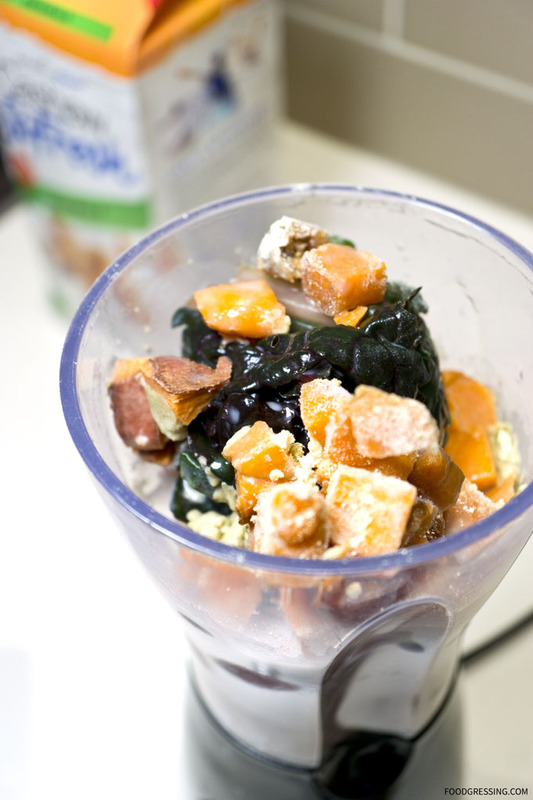 The Good Stuff: Ready blend Smoothies + GIVEAWAY! A new year marks new beginnings and a new Vancouver company is making it easier to eat healthier in a no-frills kind of way. 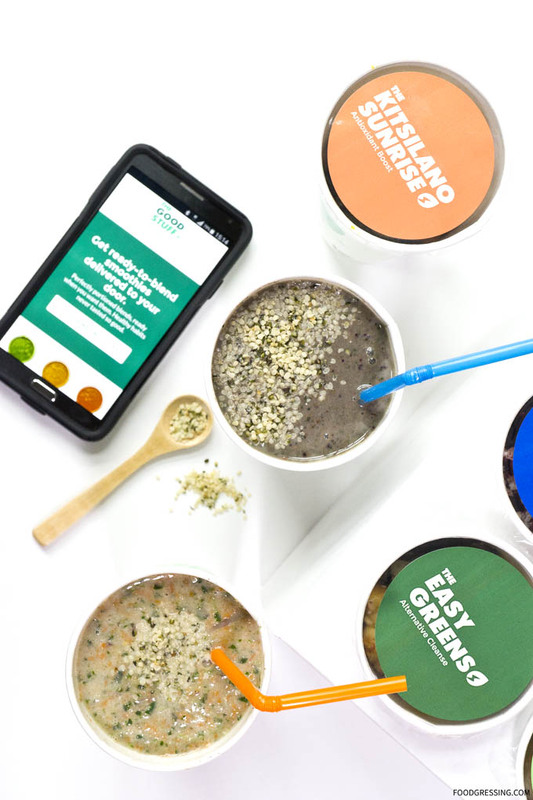 The Good Stuff is Vancouver’s first “ready-to-blend” smoothie company that delivers to your door. “Ready-to-blend” means recipes with whole ingredients, frozen and perfectly portioned for your blender. The company was founded by UBC alumni who as varsity athletes wanted to create something that makes truly healthy eating easier. They took up gardening to develop their first products before going to UBC Farm for ingredients and consulting a leading dietitian to help craft the recipes. Last month, The Good Stuff reached out to me to try out their smoothies including their delivery service. Disclosure: I received complimentary samples for the purposes of this review. Made with local and organic ingredients, The Good Stuff smoothies are about healthiness in a cup. 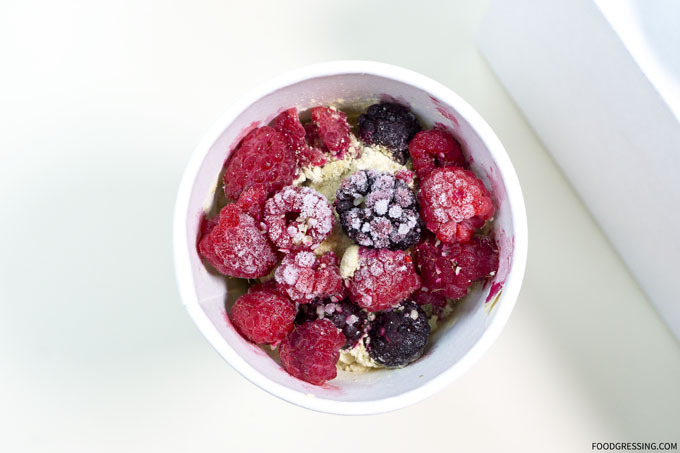 And did you know frozen produce is up to 45% more nutritious than its grocery-shelf companions? The Good Stuff’s smoothies are good up to three months if kept frozen. The smoothies have fun names like Good Morning Smoothie, Kitsilano Sunrise Smoothie, Purple Cowboy Smoothie and so forth. They are also labelled for their benefits like focus enhancing, stress buster, and hunger halter. The process to preparing the smoothie is very simple. First you remove the container from the freezer, add a base (eg, milk, soy milk, almond milk), pour the mixture into a blender, blend for 30 seconds, and then enjoy the smoothie. 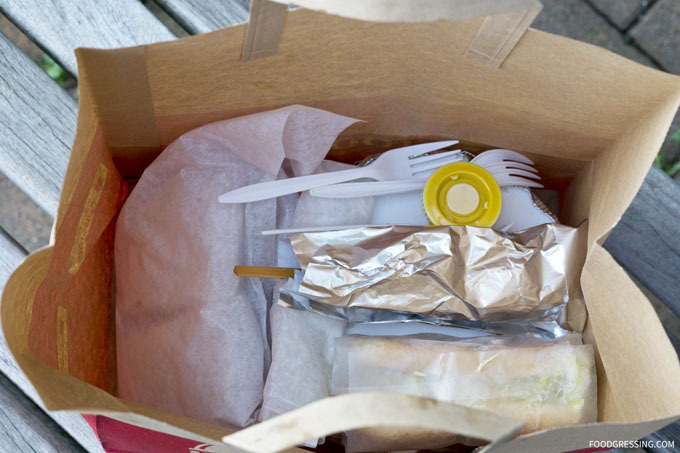 All the packaging is compostable so there is no waste. 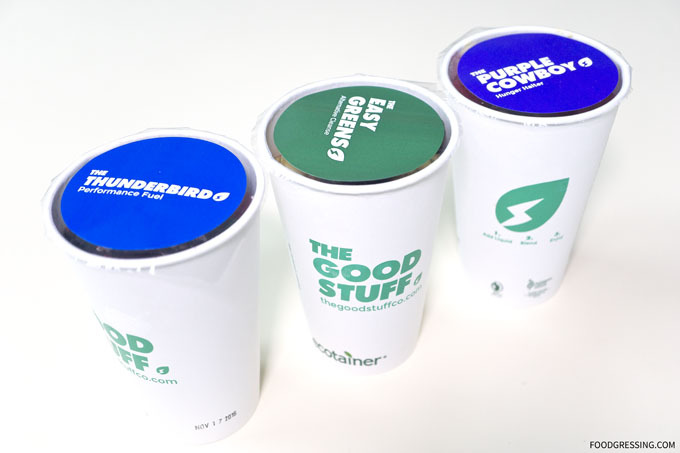 The smoothies come in 16oz paper cups and a standard cup, with 250mL water will create roughly a 500mL smoothie (one tall glass). I tried the Easy Green, Madagascar, Thunderbird, Diesel Monster, Wise Ninja and Kitsilano Sunrise. In general, I thought that they tasted pretty good considering that they have a blend of both fruits and veggies. Keep in mind that these are health drinks and do not involve artificial sweeteners to enhance the taste. 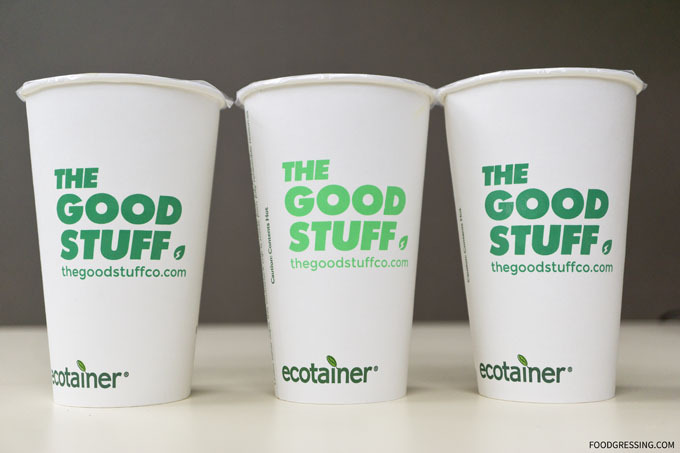 The Good Stuff is opening up their new Kitsilano storefront this week at 4515 W 10th Avenue. They will be serving up a healthy menu of smoothies, smoothie bowls, wraps, and salads. The smoothies are priced around $6 – $7 each but you can also purchase bundles for volume discounts. 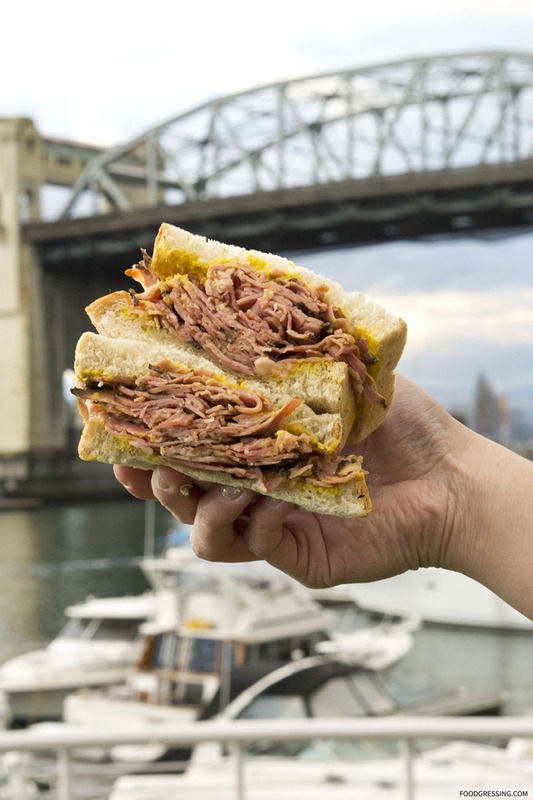 As for delivery, The Good Stuff currently delivers within Vancouver and the North Shore. Please check the delivery zone here. 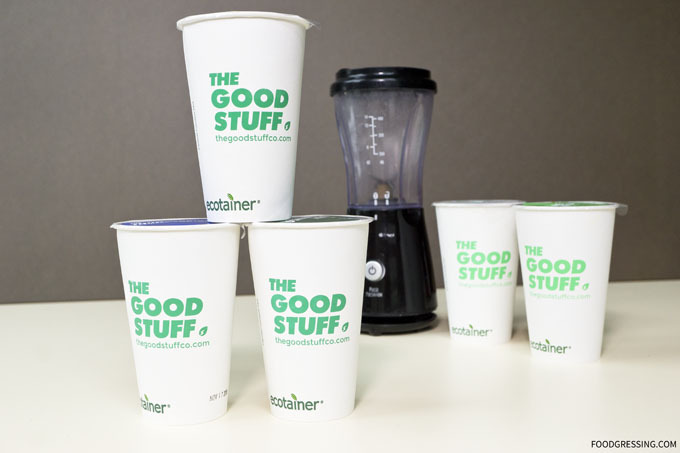 Thanks to The Good Stuff, I am giving away a smoothie sampler 6-pack to one lucky follower! Giveaway open to Metro Vancouver residents and ends at 23:59 PST January 27, 2016. McDonald’s has certainly upped their game recently with the introduction of breakfast pastries to their menu. 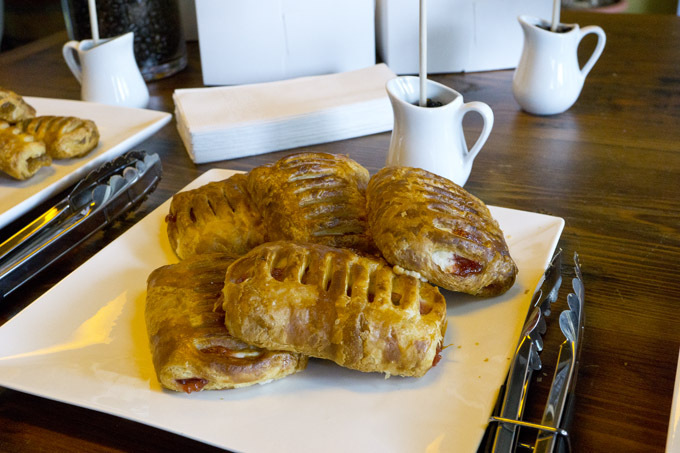 While not all McDonald’s locations sell the pastries, they are slowly getting to be more widely available. Here is a a review of some of the McDonald’s pastries that I have tried. Taste: I found McDonald’s Croissant to be quite delicious! Buttery, flaky and slightly crumbly – it exceeded my expectations. When you handle the croissant, you get some residual butter on your hands. That’s how buttery it is! Excellent taste and quality for the price. Suggested pairing is a cappuccino. Rating: 4/5 – I recommend this. Taste: Made with all butter and filled with semi-sweet chocolate, it’s a lot of yummy in every mini bite. It’s essentially a mini pain au chocolat and the amount of chocolate is pretty reasonable in my opinion. Rating: 4.5/5 – I recommend this. Taste: Made with all butter and real raspberries, it’s the fruitier version of the mini chocolatine. I thought the raspberry filling was too sweet. The mini raspberry has slightly less carbs and grams of fat than the mini chocolatine. Taste: Made with all butter and Canadian Maple Syrup. Simple and very Canadian. Not much difference in terms of nutrition compared to the mini chocolatine. Taste: Made with real strawberries and a sweet cream cheese filling. I thought the filling was too sweet. Turns out it has quite a bit of calories – 330! 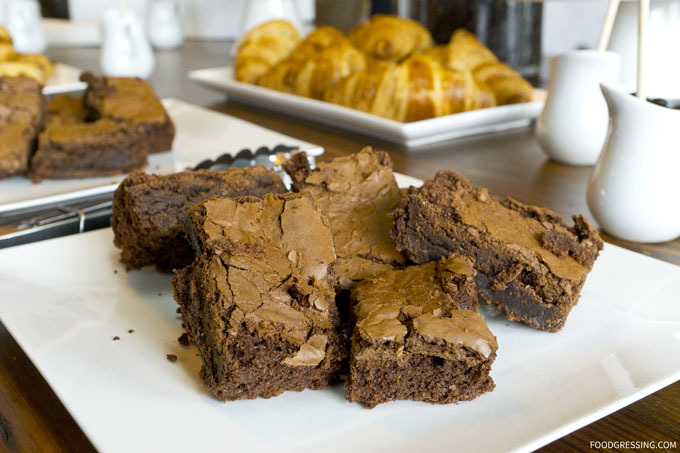 Taste: It is made by Toronto’s famous bakery, Dufflet, and is absolutely decadent, rich, chewy and chocolaty. However, it is a high calorie pastry with 310 calories and 42 grams of carbs! 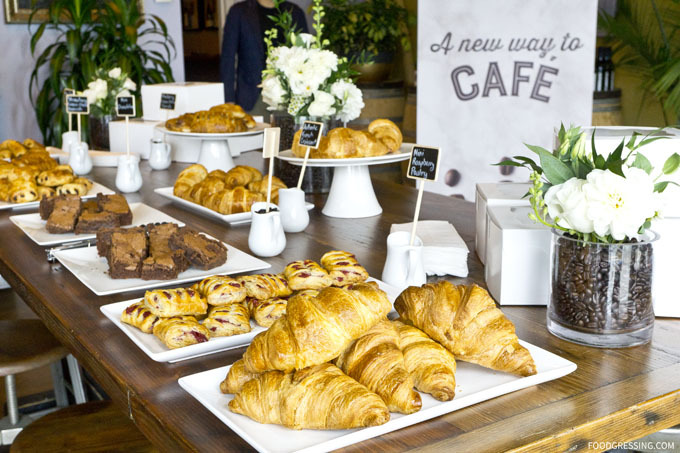 My recommendations are the regular croissant, mini chocolatine, mini maple and chocolate chunk brownie. What’s your favourite McDonald’s pastry? Let me know in the comments below. For more information on McDonald’s pastries, visit them online. If you’re still looking for a holiday gift or needing to bring something to a party or event, you might just want to head on over to Cupcakes. 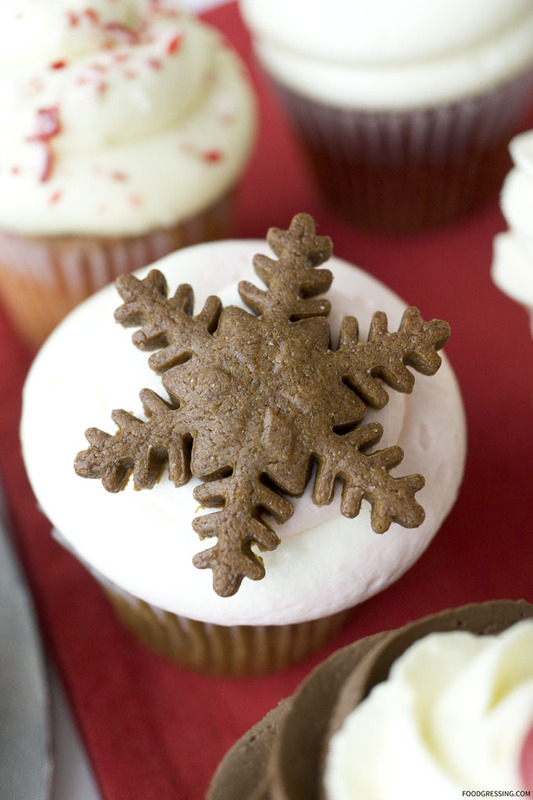 In time for the holidays, Cupcakes has a few seasonal offerings that is bound to impress. 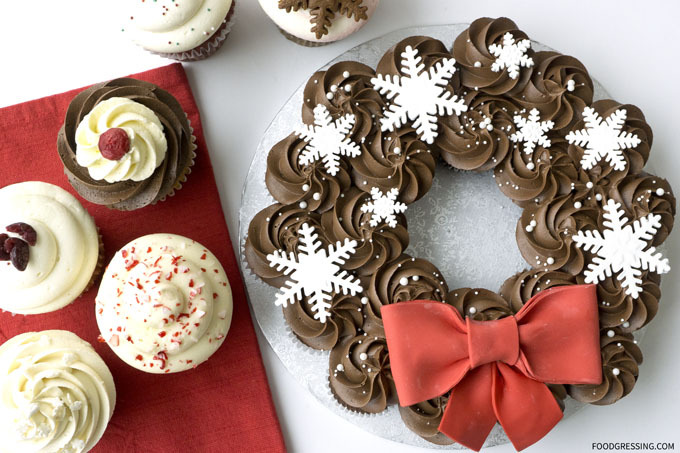 First is the adorable and very Instagram-worthy cupcake wreath comprised of mini-cupcakes. 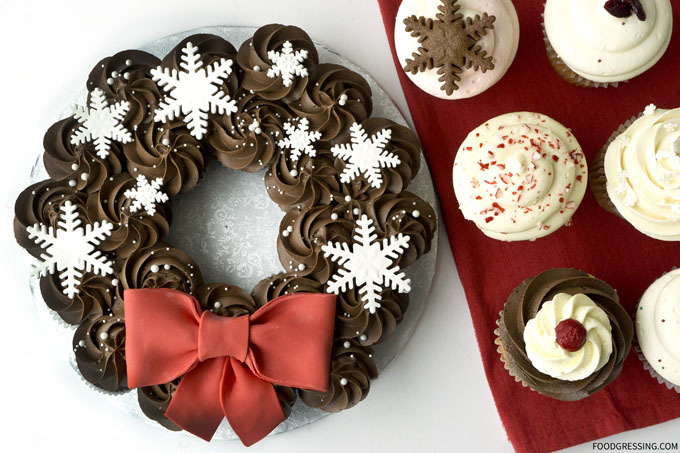 The wreath comes in four sizes which vary by number of mini-cupcakes: small – 8 ($19); medium – 22 ($45); large – 32 ($60); and extra large – 48 ($75). The wreath can be made with all cake and buttercream flavours available. 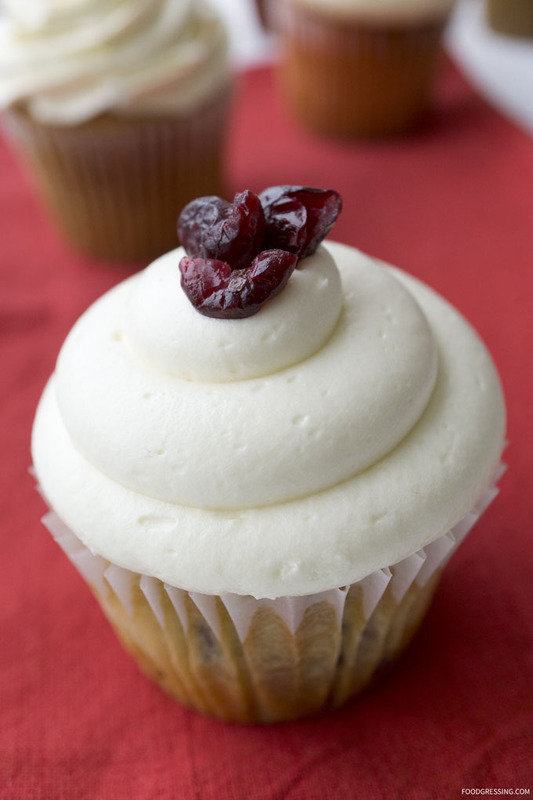 As for season cupcakes, there are a few mouthwatering options (priced between $3.50 – $4.50). 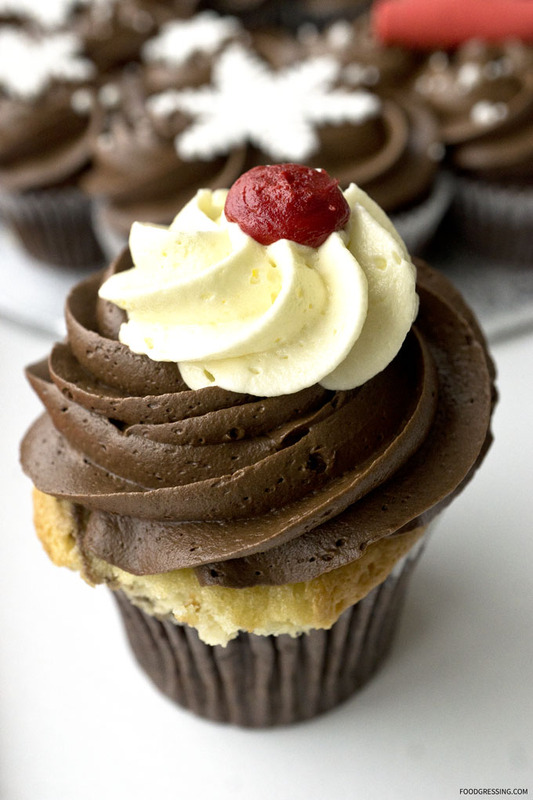 All cupcakes are baked from scratch daily and are made using natural, preservative-free ingredients. Local ingredients are used whenever possible. ‘Tis the season for giving and Cupcakes is giving back to the community. Every day until Christmas, each Cupcakes franchise location is doing something good for the community. The Guildford Mall Cupcakes location donated toys and cupcakes to the Salvation Army toy mountain drive; the Abbotsford location donated cupcakes to the Abbotsford Hospice Society as part of their high tea party; and the Broadway corporate location went to the Salvation Army Belkin House to cook and serve dinner to all the residents. You will be seeing some changes in Cupcakes in the near future. They are undergoing a complete rebrand to bring customers the same great cupcakes, but with a modernized twist. They will also be expanding their product line to include ice-cream (Betterwith Ice Cream developed by Lori), cupcake milkshakes, pastries (savoury and sweet), specialty cakes, cakes by the slice, and a coffee/tea program. To learn more or pre-order these Cupcakes seasonal offerings, visit originalcupcakes.com or social media (Facebook, Twitter, Instagram). Disclosure: I received a complimentary sample for this post. 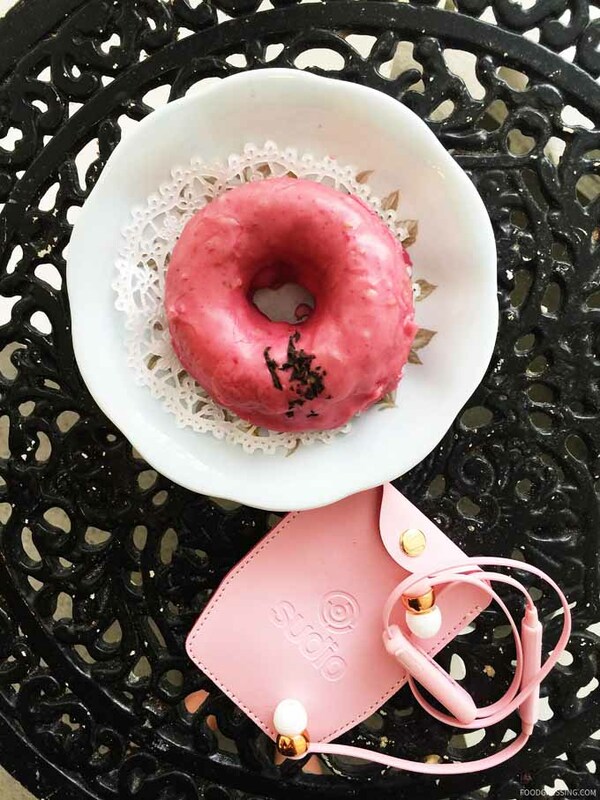 Whether you are eager for some restaurant food without the hassle of going out to get it or are in need some comfort food wherever you are, foodora may be the service you just need. Online food delivery company, foodora, recently launched in Vancouver. 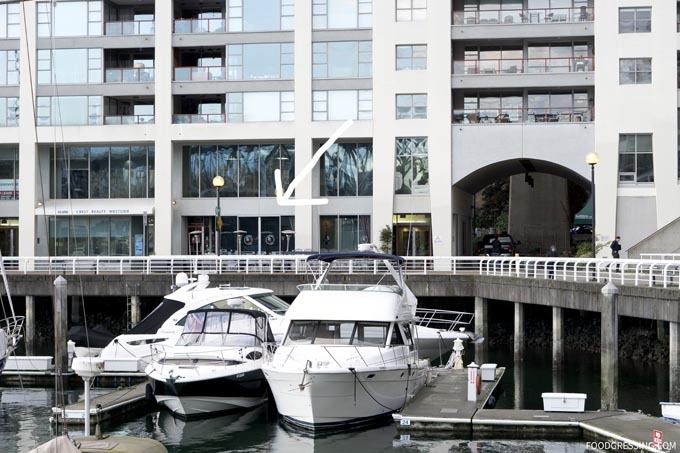 foodora Vancouver has a stellar list of partnering local restaurants including Bau Haus (yes, fine dining! ), The Poke Shop, and Little Saigon. Founded in Berlin, Germany, foodora is a well-established food delivery service now operating in 10 countries world-wide with over 6,500 partnering restaurants. Last year, foodora entered the Canadian market by acquiring Toronto-based delivery firm, Hurrier. They soon expanded to Montreal where they rebranded Hurrier services to foodora. To promote their expansion to Vancouver, I was contacted by foodora to try out their service. And because they say they deliver anywhere (whether on Granville Island or even Stanley Park), I decided to test foodora out. 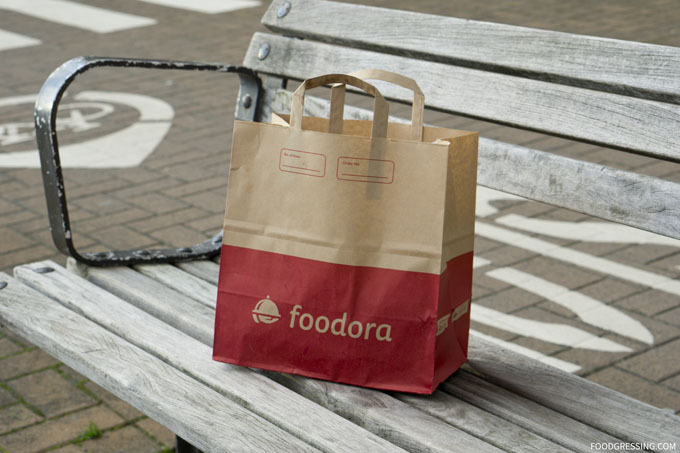 Using the foodora app (iPhone or Android) or website, customers can look for restaurants delivering to their area, place an order, track as it is prepared and receive the delivery in about 35 minutes. 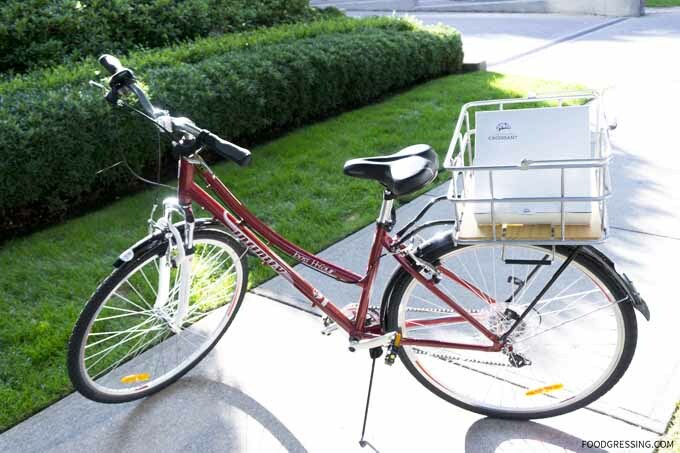 One of the great aspects of their delivery service is they can be eco-friendly because they use bike couriers in addition to cars. foodora priced the delivery fee to be just about the same as a bus ticket – that is, between $3.50 – $4.50 depending the amount of your order. I found the app to be user-friendly and I was able to enter the order without any issues. Disclosure: I was provided a complimentary foodora voucher for this review. Last week, I tested out foodora’s “deliver anywhere” service. 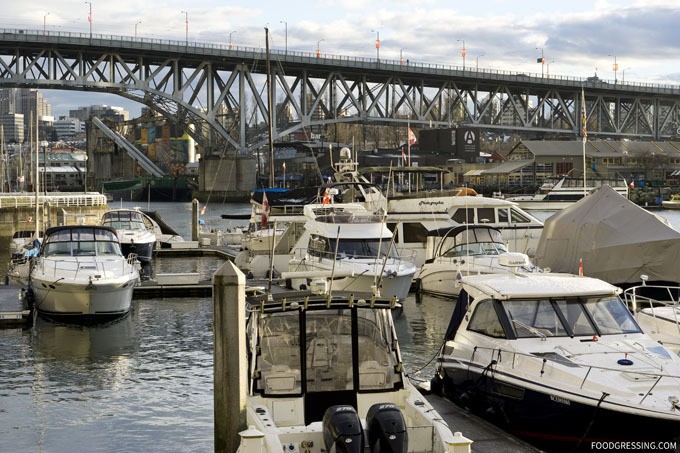 Imagine this scenario: you’re enjoying a nice walk around the Seawall. It’s a dry, non-snowy but still very cold day and you’ve suddenly become hungry. There are very limited restaurants where you are and what you need some hot comfort food to warm you up. This is where foodora comes in. 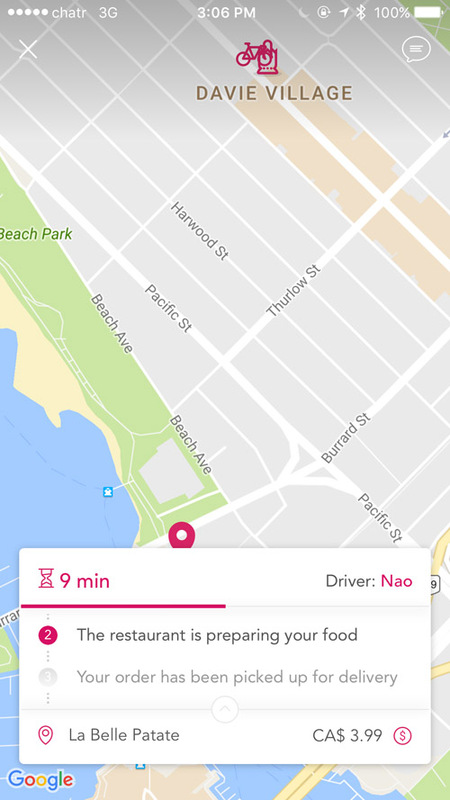 I decided to see if foodora could deliver to me at a location along the Seawall on the English Bay (North) side of False Creek.. A physical address was needed so I gave them 1010 Beach Avenue, which is a bit of a tricky location. It’s actually the address of the restaurant Ten Ten Tapas. On a cold day, wouldn’t it be nice to enjoy some piping hot comfort food? I decided to order some poutines, Montreal Smoked Sandwich, and hot dogs from La Belle Patate. After the order was placed, I was able to track the progress of the delivery. In fact, you can see where exactly the courier is and the estimated time of arrival. 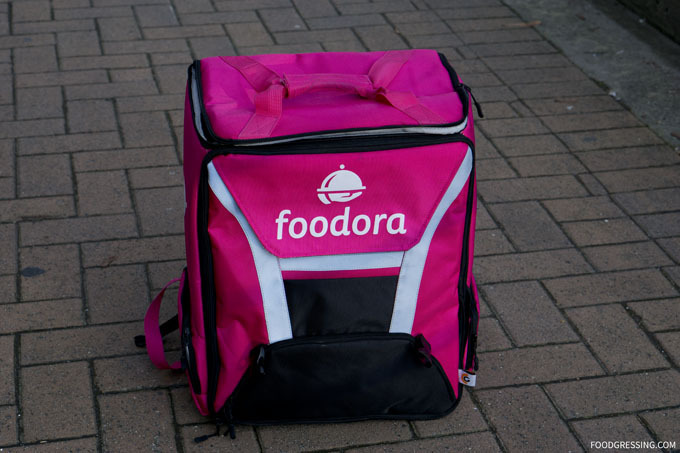 Lo and behold, within 30 minutes, my order arrived in a foodora branded insulated bag. The delivery guy came by car but met me on the seawall by foot. My actual order which had five items came in a brown paper bag. Utensils, condiments, and nice and HOT food! 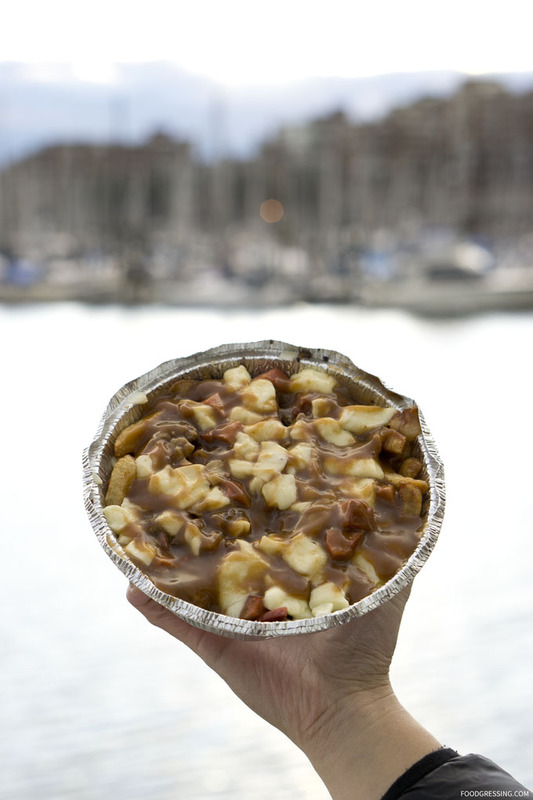 And so, I was able to enjoy some piping hot poutine with a waterfront view. Thanks to Foodora, I am giving away two vouchers to foodora. 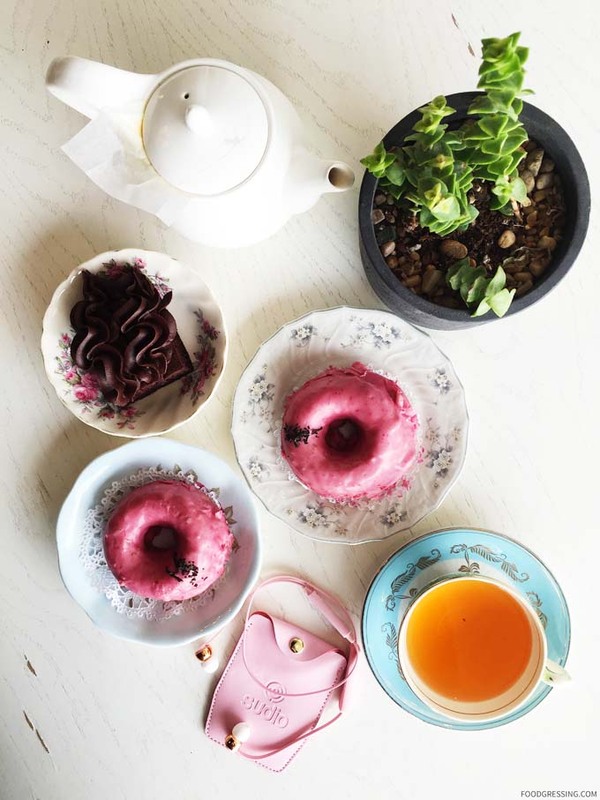 One Instagram follower will win a $30 foodora voucher and one blog follower will win a $15 foodora voucher. Both giveaways end Wednesday, December 21st 23:59 PST. Open to Metro Vancouver residents only. 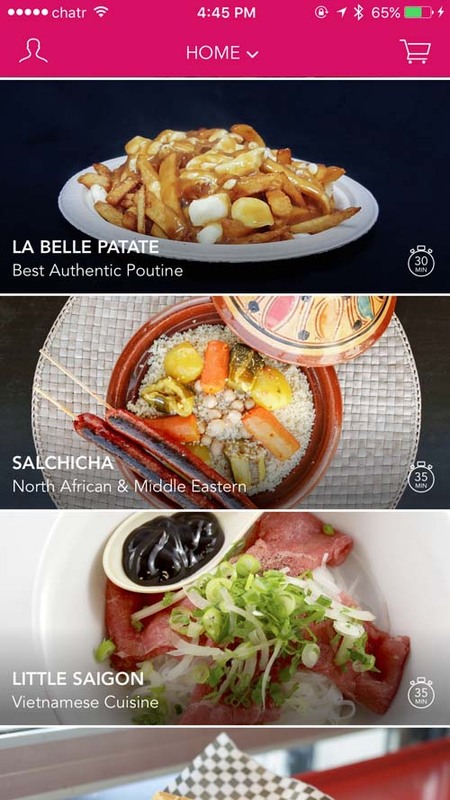 @foodora_ca is now available in #Vancouver! 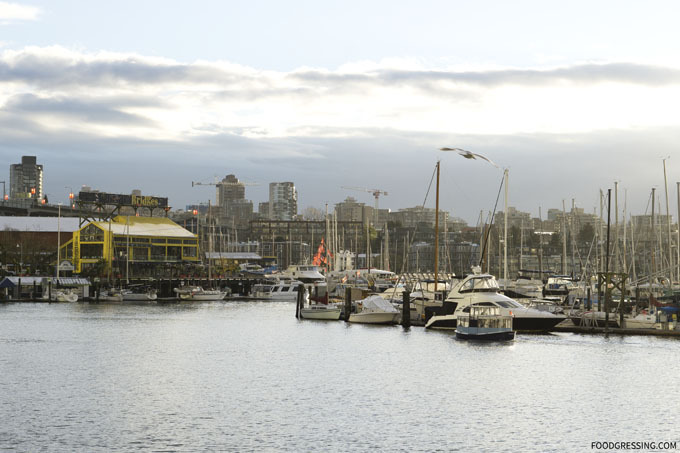 They #DeliverAnywhere so imagine getting some hot comforting food while enjoying a stroll around the Seawall. That’s what I did and I got myself a tasty delivery of poutine and Montreal Smoked Meat sandwiches by @lbp1215. Here’s your chance to win a $30 voucher to try out foodora: – 1 LIKE this post 2 FOLLOW @foodora_ca + @Foodgressing 3 TAG at least two friends – Giveaway closes December 21, 2016 at 23:59 PST. Open only to Metro Vancouver residents. Visit Foodgressing.com for another chance to win a foodora voucher. – Per Instagram rules, we must mention this is in no way sponsored, administered, or associated with Instagram, Inc. By entering, entrants confirm they are 13+ years of age, release Instagram of responsibility, and agree to Instagram’s term of use. It was a no-frills experience ordering with foodora Vancouver and I would recommend their service. If you want to download the app, please use my referral link where both you and I can enjoy $10 off our next order. (The link last checked February 12, 2018). For more information, visit foodora online or social media (Facebook, Twitter, Instagram). To see my previous review of La Belle Patate, click here. If you’re looking for a good stocking stuff this year, you might just want to consider Brockmann’s Chocolates. The Brockmann family has been creating delicious chocolate recipes for over 80 years, and is now celebrating their 30th year in Canada. 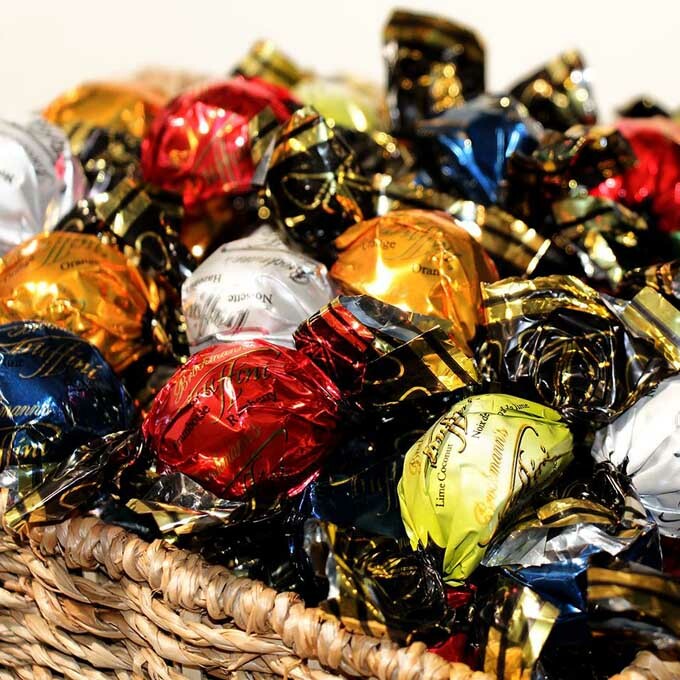 It all began in the 1930’s in Munich, Germany with Willy Brockmann, a master confectioner, and his son Norbert who followed in his footsteps and brought Brockmann’s Chocolates to Canada in 1986. 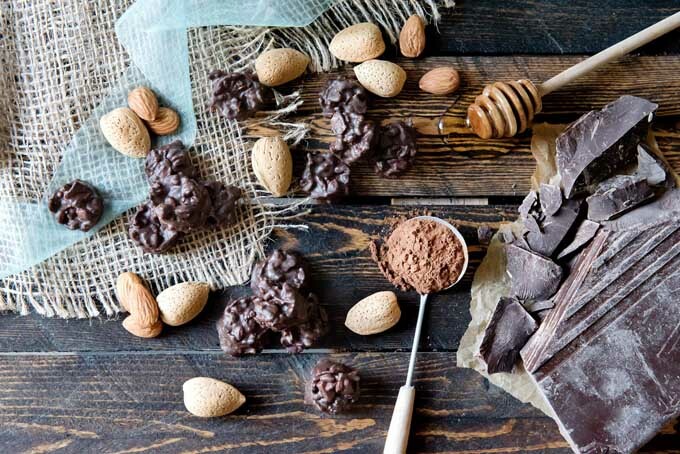 Brockmann’s Chocolates are made right here in BC with natural ingredients, no preservatives, no artificial colours or flavours, are gluten-free and certified Kosher. You can find them at Save on Foods, Urban Fare, Fresh St Market, Choices, IGA, Price Smart, Fairway Market, and Nesters. I recently tried their “Truffini” and “Crunchetti” chocolates courtesy of Goodlifevancouver.com. The Truffini are premium dark, milk and white truffles available in gift boxes and foil wrapped bulk chocolates. You can pick your favourites from the bulk section of your local fine foods retailer. Traditional flavours include Cappuccino, Canadian Maple, Hazelnut Praline, Classic Milk, Lime Coconut, English Mint, Double Dark, Orange and Raspberry. The new holiday flavours are Salted Caramel and Dark Sea Salt truffles. These truffles are melt-in-your-mouth delicious and very satisfying. My favourite flavours were the Double Dark and Raspberry. 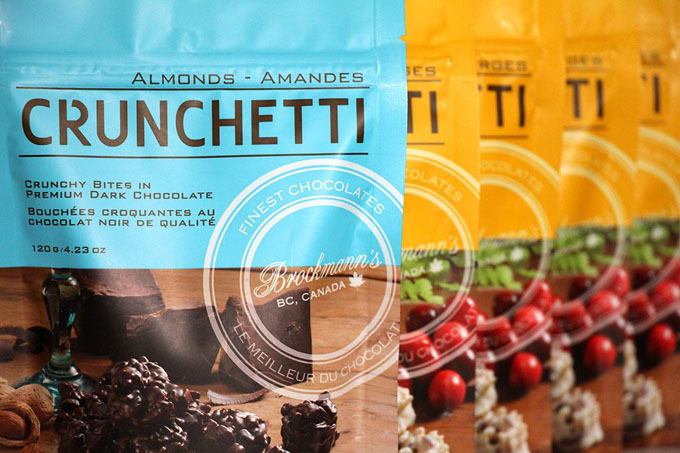 The Brockmann’s latest creation, “Crunchetti” is a line of premium snacking chocolate. These crunchy, bite-size clusters are made in small batches with toasted almonds and blended with fine-quality chocolate. Crunchetti flavours are available in Dark, Milk and White Chocolate with Cranberries. I have to admit that the Crunchetti were absolutely tasty and totally addictive. I love their crispy and crunchy texture. They are so good that they entice you to keep on eating! I receive samples of all three flavours and I enjoyed the White Chocolate with Cranberries the most because of the fruitness. For more information on Brockmann’s Chocolate, visit them online or social media (Facebook, Twitter, Instagram). Disclosure: I received complimentary samples of Brockmann’s Chocolates. 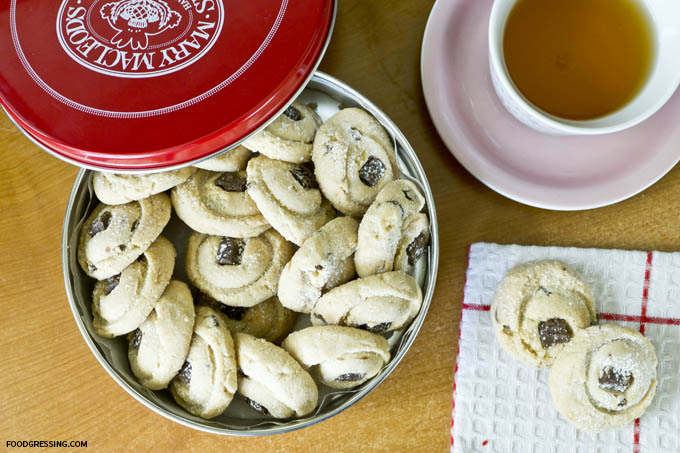 Mary Macleod has been crafting unforgettably delicious cookies since 1981. The story began when Mary began baking her signature Chocolate Crunch shortbread from a small shop under the marquee of the Capitol Theatre in Toronto. Her shortbread became a sensation and continues to delight cookie lovers in Canada and internationally. I recently received a package of Mary Macleod’s delicious butterscotch shortbread bars. 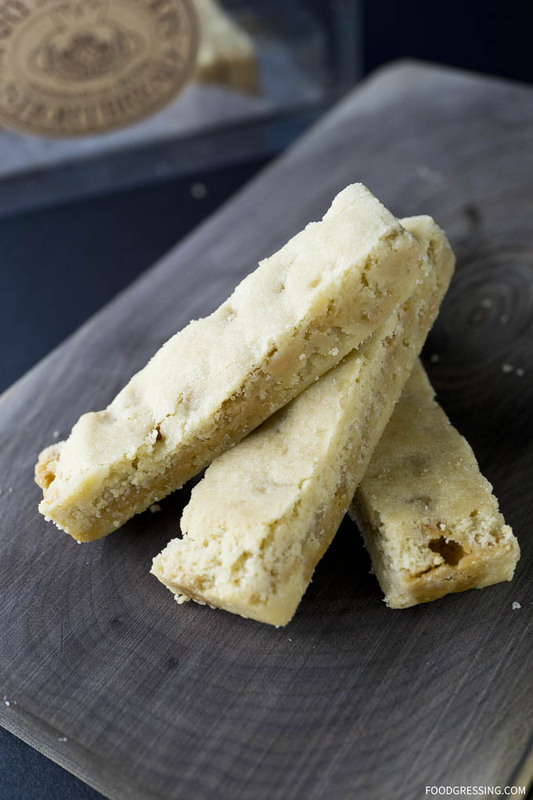 These decadent shortbread bars are made with two sugars and an abundance of butterscotch chips. I love their rich caramel colour and unique fudge like quality! These bars come as a set of 12 in a clear gift box with a decorative ribbon. A great treat to enjoy at tea time with company or to give as a gift for the foodie in your life. Thanks to Mary Macleod, I am giving away a package of these butterscotch bars to one lucky follower. Giveaway is open to Canadians and ends November 30, 2016 at 22:00 PST. 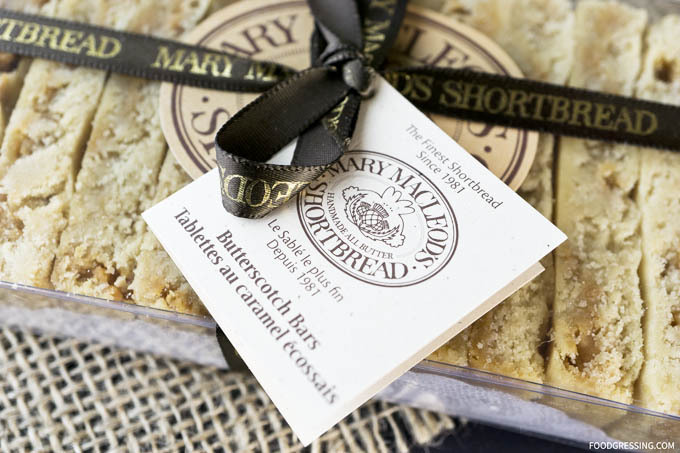 Mary Macleod’s Shortbread cookies are available at select gourmet shops and boutique retailers across Canada. In Toronto, they have a retail outlet and bakery at 639 Queen Street East in Toronto. You can also conveniently purchase their treats online through their website. They ship anywhere! Be sure to check out Mary Macleod on their website and social media (Facebook, Twitter and Instagram) for more holiday ideas! In today’s society, we’re usually connected to something. Whether it’s our smartphone, the Internet or social media, our everyday lives are wired. One company is helping people to untangle some of those wires through their wireless technology. 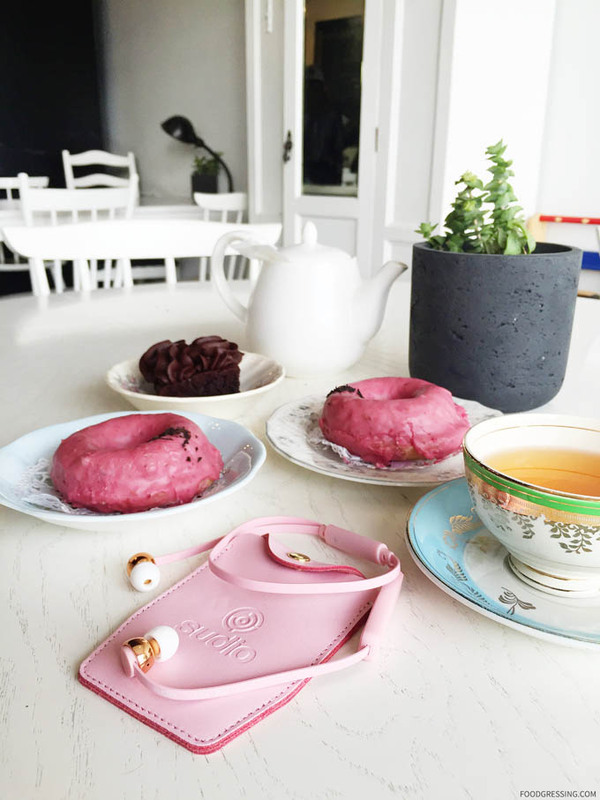 Meet SUDIO, a consumer electronics company and lifestyle brand based in Stockholm, Sweden. 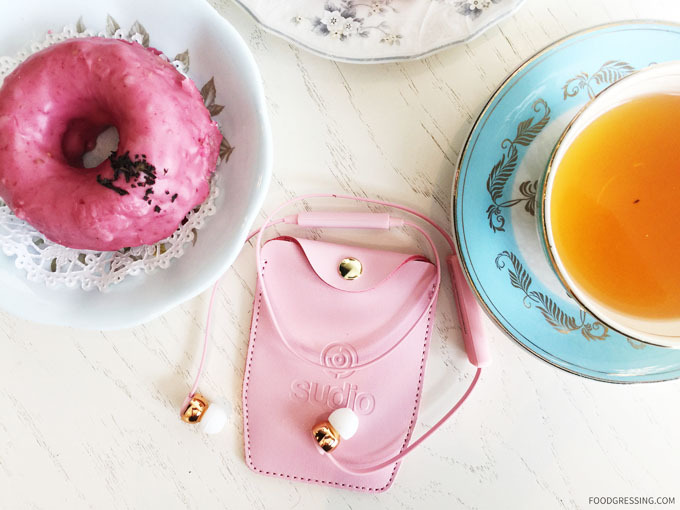 SUDIO is the creator of elegant earphones with both studio quality sound and exquisite quality. Their electronics products are not only practical but also stylish accessories and suitable for all types of individuals and lifestyles. As someone who is on-the-go a lot, I appreciate a good pair of wireless, hands-free earphones; they definitely help to give me a bit of pep in my step while I’m on the move. Recently, SUDIO got in touch and asked me to review their top-of-the-line Vasa Blå bluetooth earphones. I have spent the last month trying them out in various everyday activities. From commuting, working in the kitchen, to foodgressing at a cafe, I have found great use and company in my new SUDIO Vasa Blå bluetooth earphones. I’ll be discussing these earphones with regards to substance and style. Starting with the aesthetics, the overlook look and feel of the earphones is elegant and minimalist. 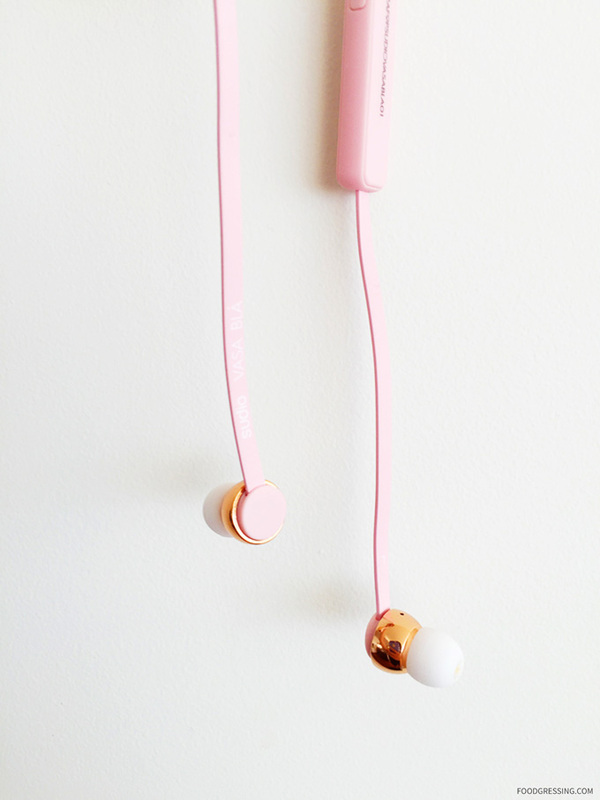 The earphones come in four colours: Rose Gold Black, Rose Gold White, Blue and Pink. I went with the pink earphones which came with gold plated, high polished metal parts. The gold parts really gave the earphones a high end look and feel. In terms of packaging, the earphones come in a sleek, nicely padded, white box that includes a leather case, 4 different sizes of earphone sleeves, a cable clip and an owner’s manual with a quality assurance card. The various sized earphone sleeves ensure that you get the optimal fit for the earphones. Furthermore, the earphones weigh only 14 grams including the battery – nice and lightweight. The cord connecting the earbuds (with the built-in remote and microphone) was a nice length – not too clunky at all. While style is important, what good is a pair of earphones if the sound quality is bad? Fortunately, that is not the case with the Sudio Vasa Blå. Listening to my playlist or streaming off of Youtube, I found the sound quality to be crisp and the bass to be deep but not too thumpy. The earphones also did a great job of cancelling outside noise such that I got lost in the whatever I was listening to. According to SUDIO, the battery is good for up to 8 hours of listening, standby up to 10 days, quick charge in 10 minutes and fully charge in 120 minutes. Ideally, I should have measured the time of my usage versus the need to charge it. For what it’s worth, I can say is that I have used it for several hours, neglected to turn it off in a timely manner and still haven’t had the need to charge it. Pretty good, I’d say. The Vasa Blå retails online for $140 CAD. 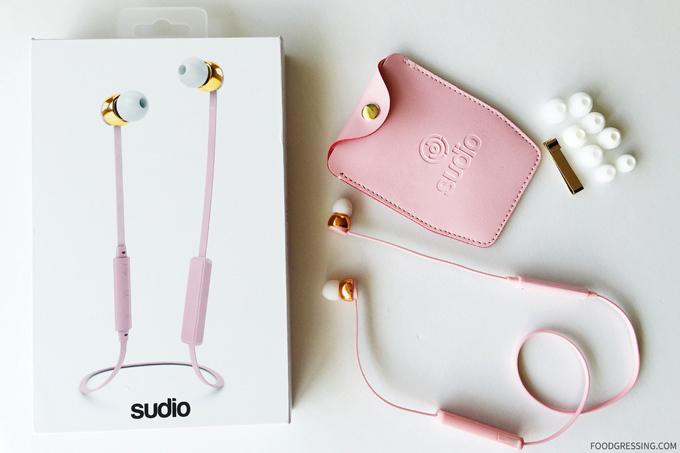 SUDIO earphones can be purchased online at http://www.sudiosweden.com/ca/ and shipping is FREE to Canada. As readers of Foodgressing.com, you can simply input the “foodgressing15” promo code at checkout to get a 15% discount off the products from SUDIO. I have to say that the SUDIO Vasa BLÅ bluetooth earphones have nicely integrated into my life. Beautiful design, lightweight and excellent audio quality, I would recommend these earphones for your personal enjoyment. Disclosure: No monetary compensation was received for this review and all opinions expressed were my own. 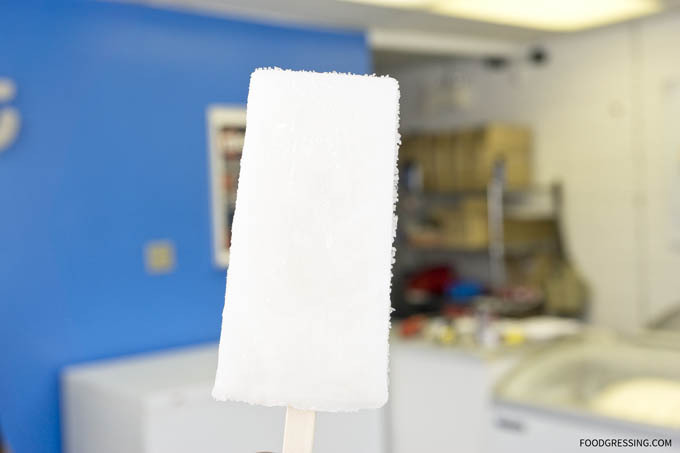 Most of us are familiar with frozen sweet treats, like popsicles and freezies, which are delicious but are made with lots of artificial ingredients. 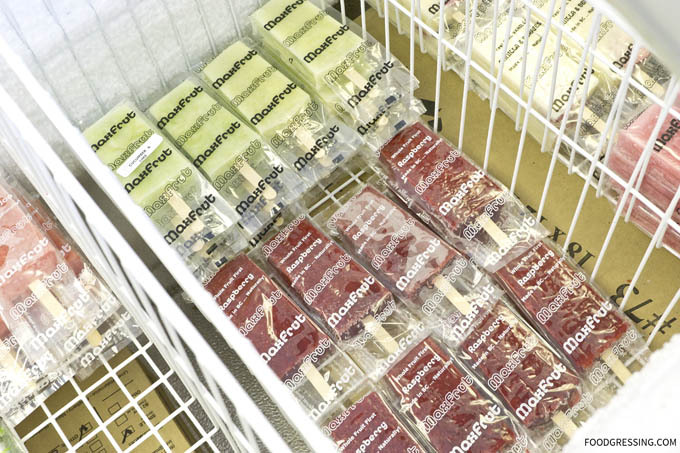 But one local BC company is putting the “healthy” back into frozen goodies. 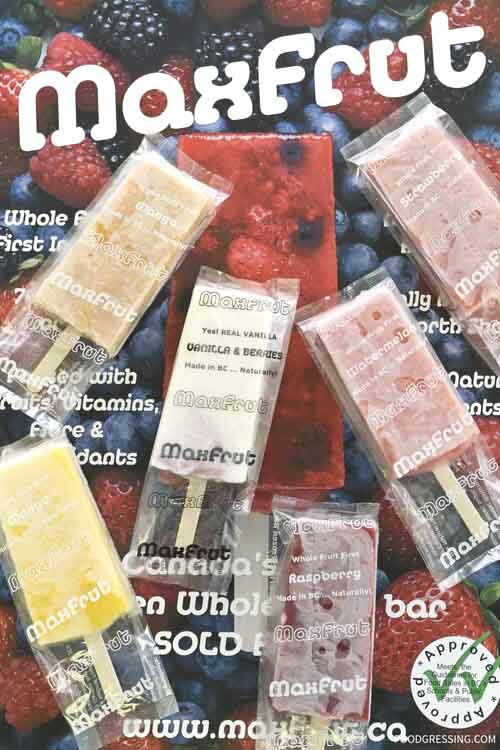 Max Natural Foods are the creators of MaxFrut – Canada’s first frozen whole-fruit bar. These bars are made with 100% all natural ingredients – that means, no artificial colours, no juice sweeteners and no artificial flavours. 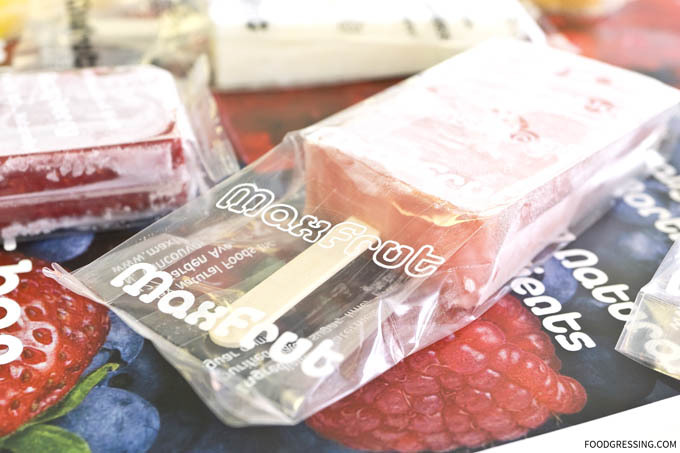 Maxfrut bars are also low-calorie; in fact, they have less than 70 calories per 90 mL of fruit bar. Max Classic flavours include Lime, Mango, Raspberry, Bumbleberry, Watermelon and Strawberry. 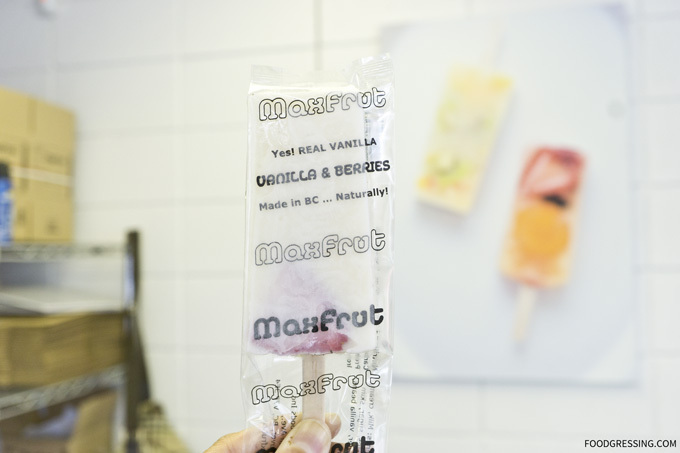 The most unique one is the Real Vanilla & Berries which is made with real vanilla beans and has a real berry (depends on season) frozen within the bar. There are other seasonal flavours like peach, pineapple, cucumber and more. Disclosure: I was invited for a complimentary tasting. All opinions are my own. At the tasting session, I tried three flavours: Real Vanilla & Berries, Mango & Chili, and Lime. The Real Vanilla & Berries was my favourite because it had an amazing milk and vanilla flavour. There were black specks on the bar which are from the vanilla pods. To give the bar some fruitiness, a sliced strawberry is within frozen within the bar. The berry can change depending on the season. 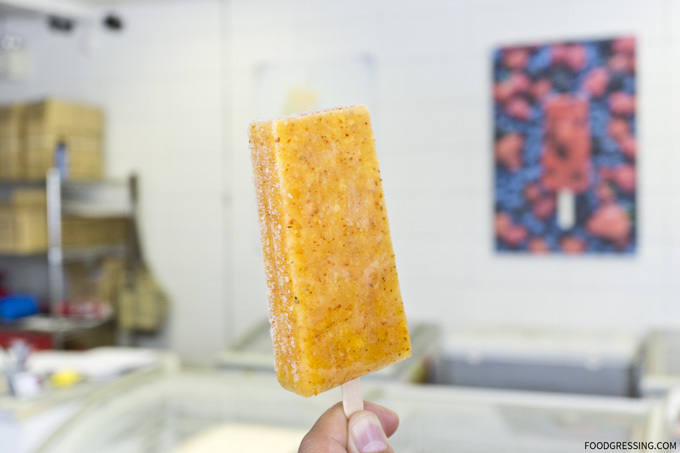 A more savoury flavour was the Mango & Chili. It definitely had a mild spicy kick to it. The mango flavour was very understated, however, compared to the chili. The Lime flavour was ultra-refreshing and hydrating! When you sucked on the bar, you could draw out the lime juice. My only issue was that it was too frozen and hard to be eaten at first. It needed a minute or two to thaw out before I could eat it. 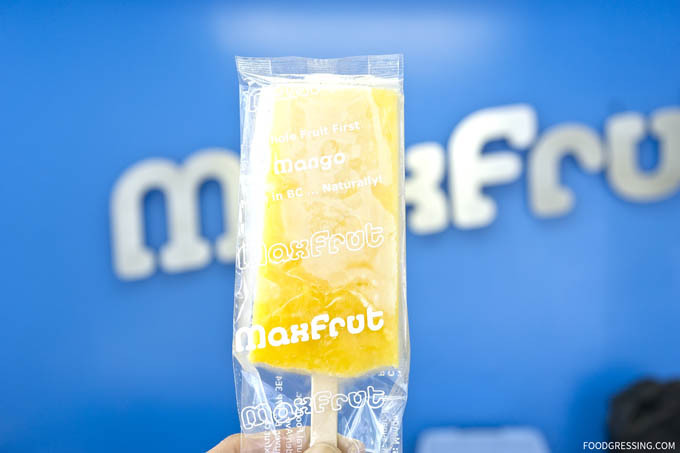 MaxFrut sells their bars right in their factory located at 127 Garden Ave in North Vancouver. They retail for $3.25 a bar and there are volume discounts. You can also find them at Whole Foods. MaxFrut is also part of hot lunch programs at various schools to help kids have a healthy but still delicious snack. For more information, visit www.maxfrut.ca. Disclosure: I received a complimentary sample for this review. All opinions are my own. Have you ever dreamed about having fresh croissants in bed? Or perhaps you want to jazz up those dull meetings at work with some amazing sweet treats? 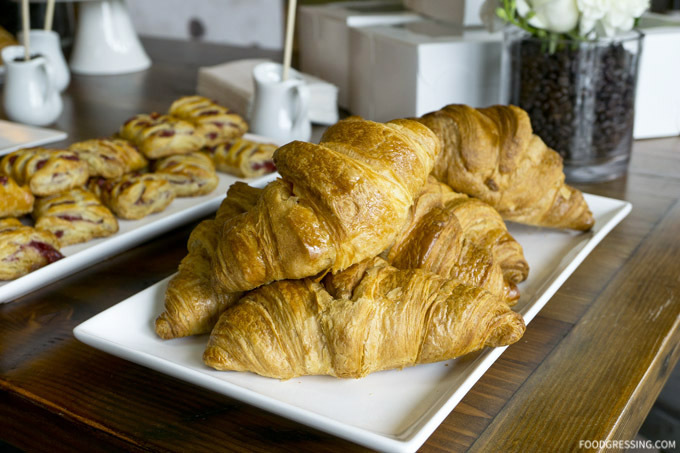 There’s a new breakfast service in Vancouver that can cater to your needs – The Cycling Croissant. And they’re about satisfying your cravings for French viennoiseries when and where you need it. 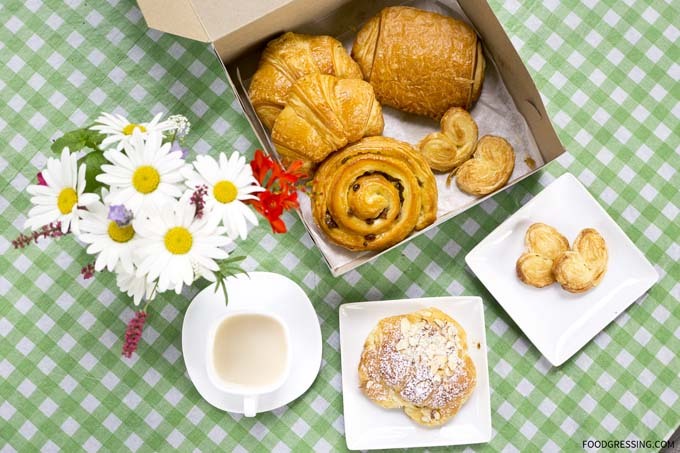 The Cycling Croissant offers a mouth-watering array of baked goodies including croissants, pains au chocolat, almond croissants, apple turnovers and more. For the perfect pairing, you can also get a fresh pressed juice like Morning Sunshine, Fresh Apples and Good Greens. The decision on what to choose can be hard so to make it easier there are a few pre-selected package options available like The Classic, Le Gourmand, Le Tête-à-tête, and Découverte. 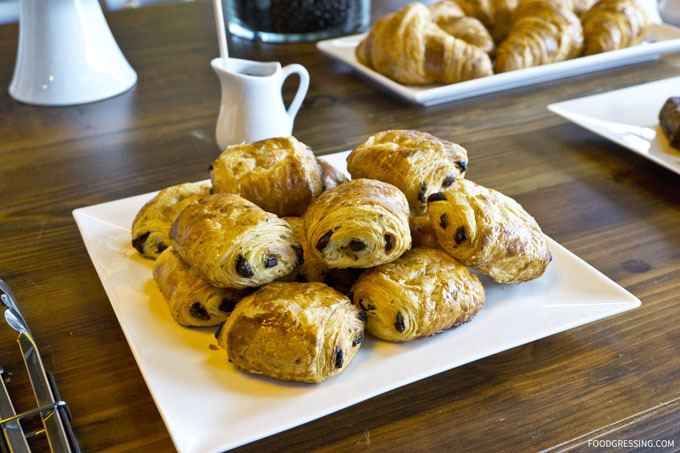 For example, the Classic contains 2 croissants, 2 pains au chocolat and 2 mini palmiers. 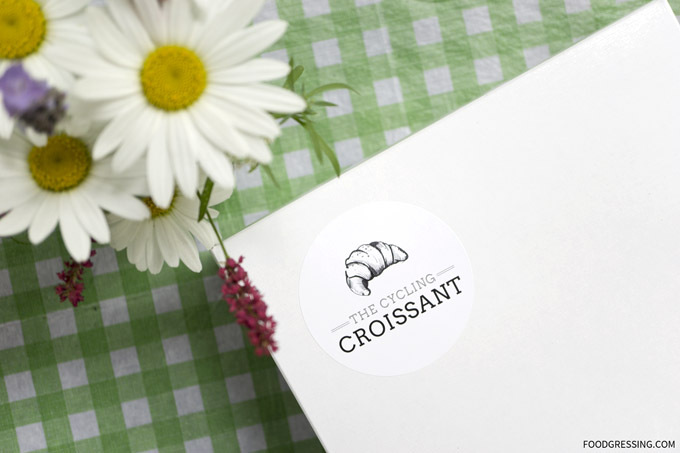 Customers can put in their order online at The Cycling Croissant website. Select the treats and add to cart. Provide your payment information and you’re done! It’s that simple. Delivery is free and the minimum order is $15. 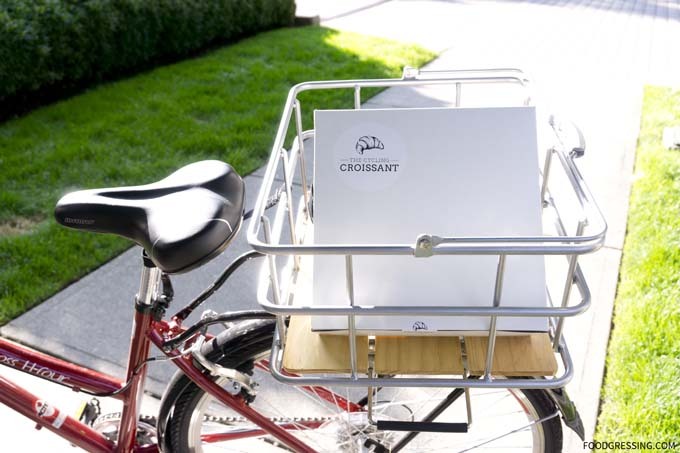 The Cycling Croissant currently delivers to areas within Downtown Vancouver, Ktisilano, Fairview and Mount Pleasant (see delivery zone). Deliveries are scheduled for 7 am to 12 pm daily. The plain croissants were scrumptious and were nicely golden brown. The shell was buttery and flaky on the outside while the inside was soft and airy. 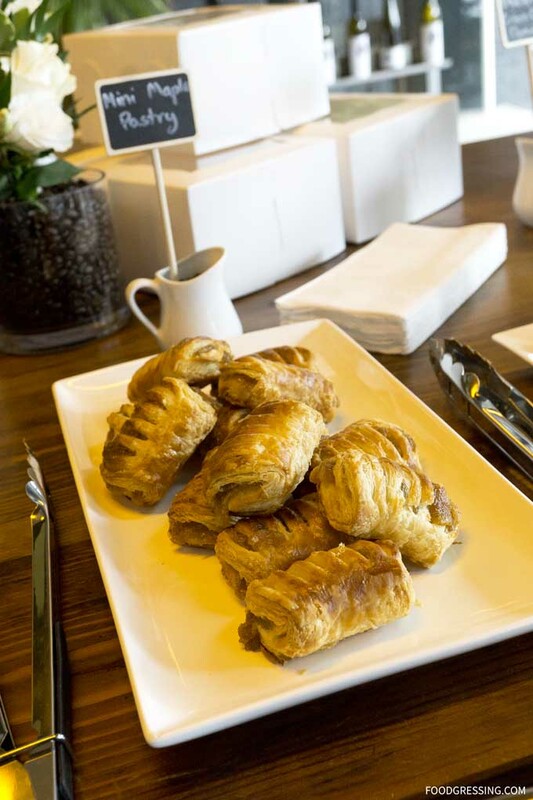 The croissants held well together and did not give out much crumbs. 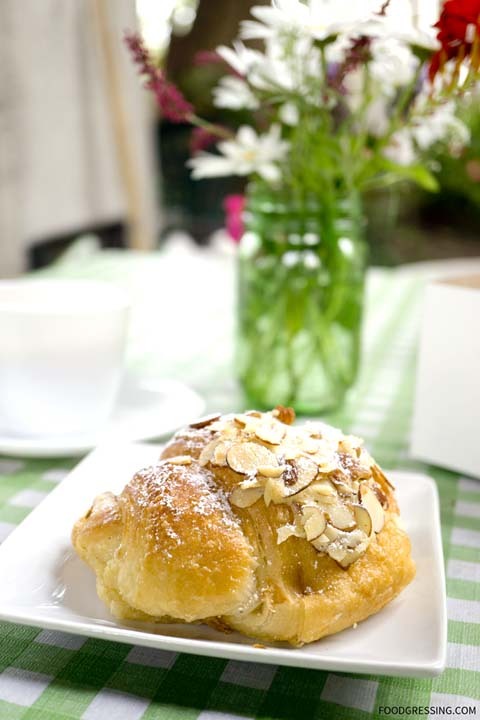 The almond croissant was a winner as well with a flaky golden crust and a luscious almond cream filling. Topped with slice almonds, this croissant is one of the best ones I have had in a while. The mini palmiers were elegant in shape and also delicious. I dipped them into my coffee and it was wonderful. 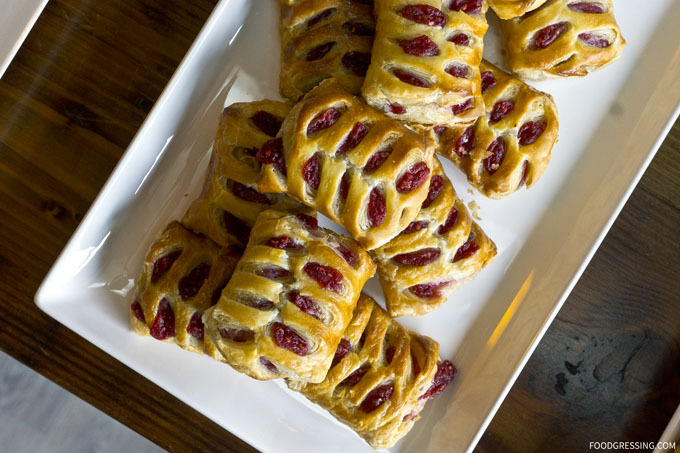 The raisin danish also did not disappoint with its buttery richness, thick sweet glaze and crispy texture. The pain au chocolat was my least favourite since I thought there just wasn’t enough chocolate for the filling. As far as pricing goes, the cost of the baked goods by The Cycling Croissant is really no different than what you pay for at a bakery. 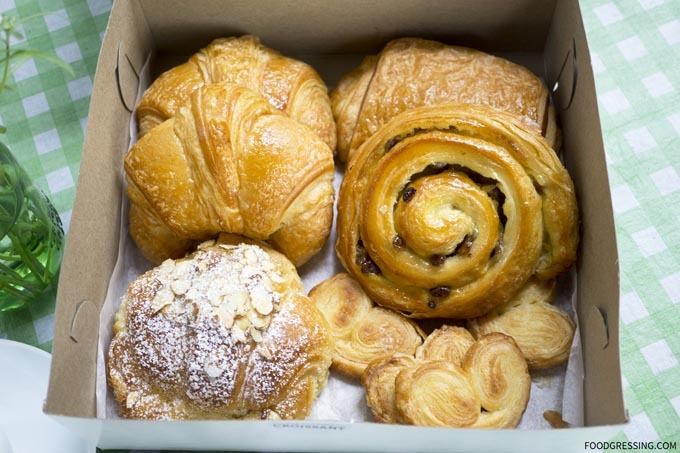 A plain croissant is $3 and the most expensive one is the almond pain au chocolate ($4.50). Very fair pricing, I think. Mary Macleod’s Shortbread + GIVEAWAY! Disclaimer: I received a complimentary product for the purposes of this review. 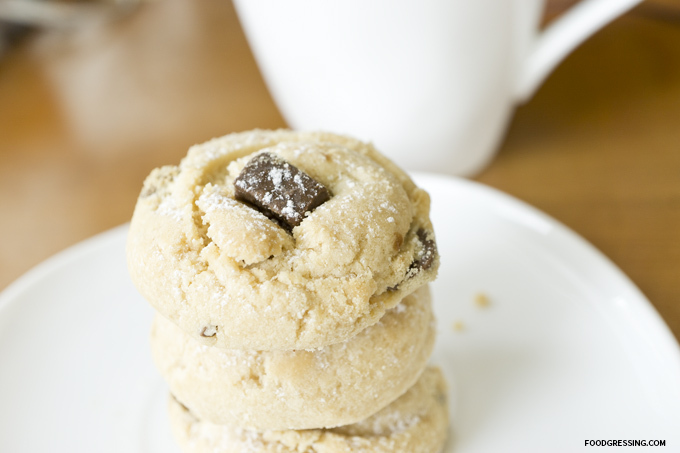 Pure, all-butter shortbread cookies – the thought of these send my foodie senses tingling. 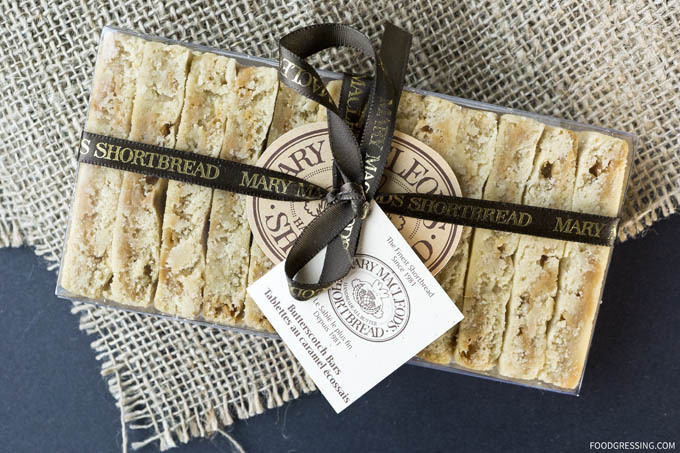 Mary Macleod’s Shortbread has been crafting unforgettably delicious shortbread cookies since 1981. Using artisanal, small-batch baking methods, Mary Macleod’s Shortbread cookies are made by passionate bakers right here in Canada. Ingredients are key as Mary Macleod Shortbread cookies are made using the finest, all natural and premium kind. 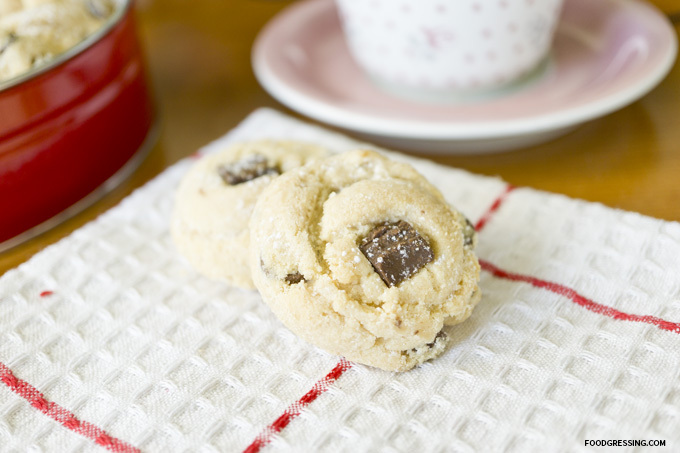 Mary Macleod’s signature product is the Chocolate Crunch shortbread. The story is that Mary Macleod began baking the Chocolate Crunch shortbread from a small shop under the marquee of the Capitol Theatre in Toronto. 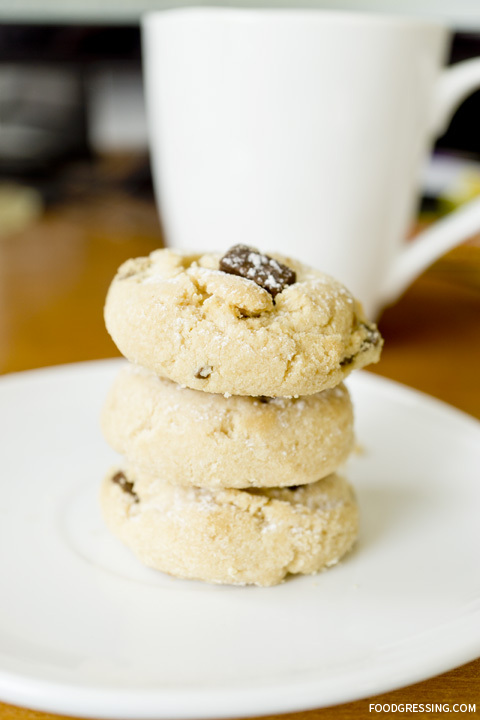 Her shortbread became a sensation and continues to delight cookie lovers in Canada and internationally. When I tried Mary Macleod’s Chocolate Crunch shortbread, it was love at first bite. The shortbread cookie was good, really good. The kind of good where you want to finish the entire tin of cookies in one sitting. The size of these cookies are just perfect. Neither too big nor too small. The texture is wonderful – tender and not too buttery. What I enjoyed the most was the crisp crunch – absolutely scrumptious! Mary Macleod’s Shortbread comes in other mouthwatering flavours including Dutch Chocolate, Hazelnut Crunch, Rolled Coconut, Espresso Chocolate, Orange Chocolate Crunch, Cranberry Almond to name a few. The packaging is so classy that these cookies make great ready-to-go gifts! 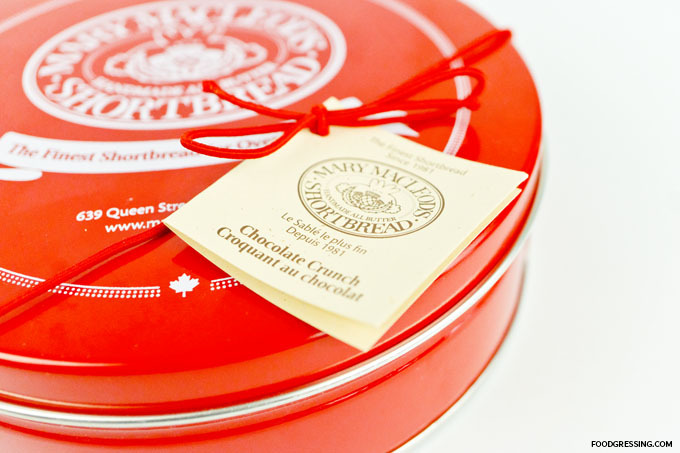 Thanks to Mary Macleod, I am giving away a small tin of their delicious shortbread cookies to one lucky follower. Giveaway is open to Canadians and ends April 29 11:59 PM.